August property sales were 1,026, up from 926 in August of 2016 and -3.5% lower than the 1,063 sales last month. August 2017 sales were at their highest level compared to August of 2016 and 2015. August YTD sales of 7,215 are running 6.0% ahead of last year’s year-to-date sales of 6,805. The median sales price in August was $1,150,000, up 17.9% from $975,000 in August of 2016 and down -0.9% from $1,161,000 last month. The average sales price in August was $1,414,164, up 11.9% from $1,264,090 in August of 2016 and up 1.1% from $1,398,577 last month. August 2017 ASP was at highest level compared to August of 2016 and 2015. 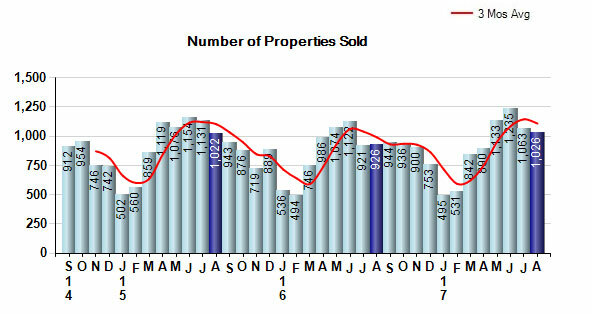 The total inventory of properties available for sale as of August was 689, down -22.1% from 884 last month and down -52.1% from 1,437 in August of last year. 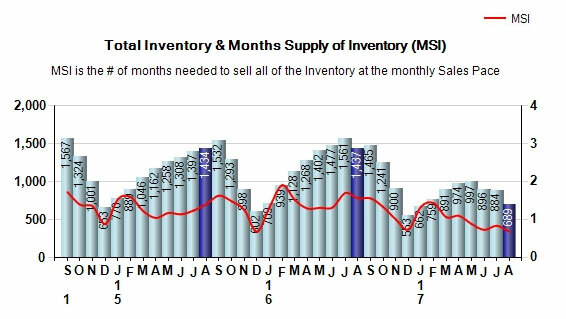 August 2017 Inventory was at the lowest level compared to August of 2016 and 2015. 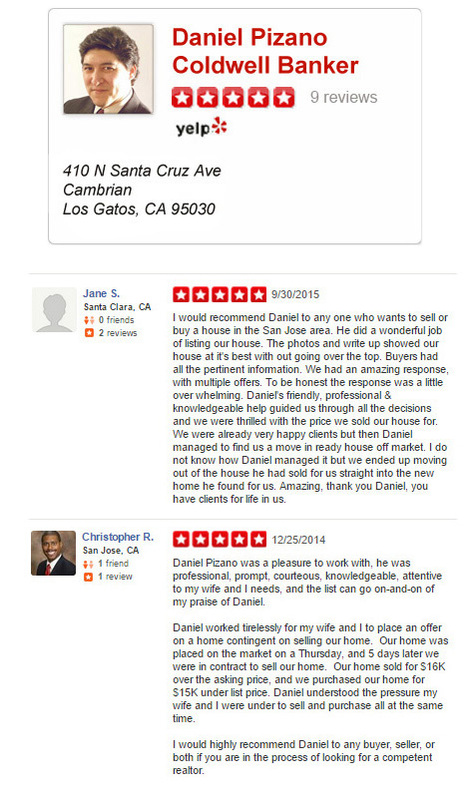 A comparatively lower MSI is more beneficial for sellers while a higher MSI is better for buyers. The August 2017 MSI of 0.7 months was at its lowest level compared with August of 2016 and 2015. 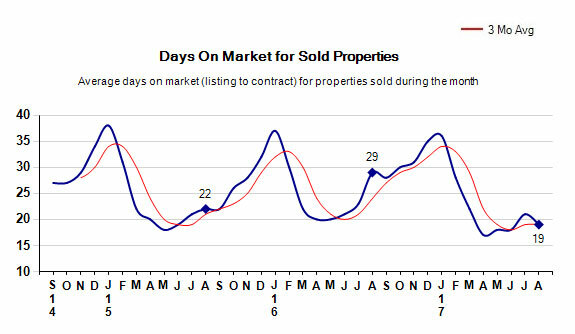 The average Days On Market (DOM) shows how many days the average property is on the market before it sells. An upward trend in DOM tends to indicate a move towards more of a buyer’s market, a downward trend a move towards more of a seller’s market. The DOM for August was 19, down from 21 days last month and down from 29 days in August of last year. The August 2017 DOM was at its lowest level compared with August of 2016 and 2015. 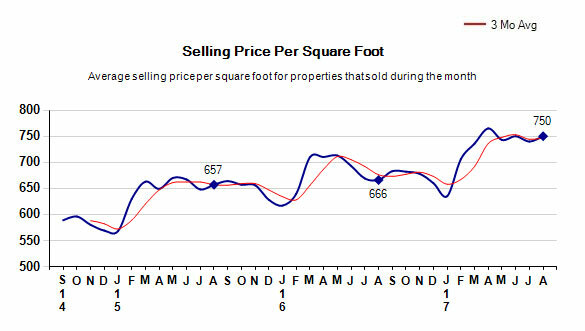 The selling price per square foot is a great indicator for the direction of property values. 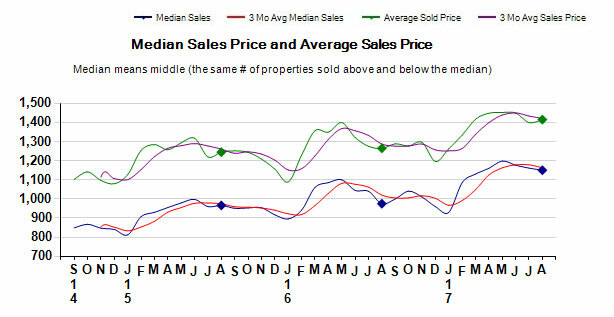 Since median sales price and average sales price can be impacted by the ‘mix’ of high or low end properties in the market, the selling price per square foot is a more normalized indicator on the direction of property values. The August 2017 selling price per square foot of $750 was up 1.4% from $740 last month and up 12.6% from $666 in August of last year. The selling price vs listing price reveals the average amount that sellers are agreeing to come down from their list price. The lower the ratio is below 100% the more of a buyer’s market exists, a ratio at or above 100% indicates more of a seller’s market. 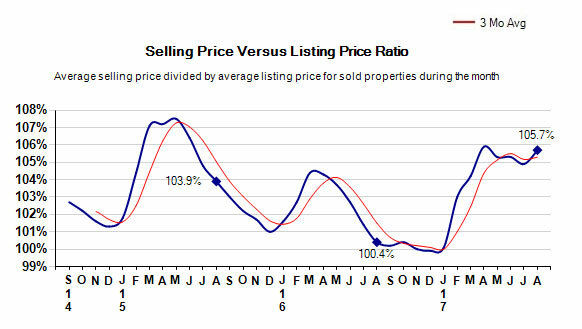 The August 2017 selling price vs list price of 105.7% was up from 104.9% last month and up from 100.4% in August of last year. 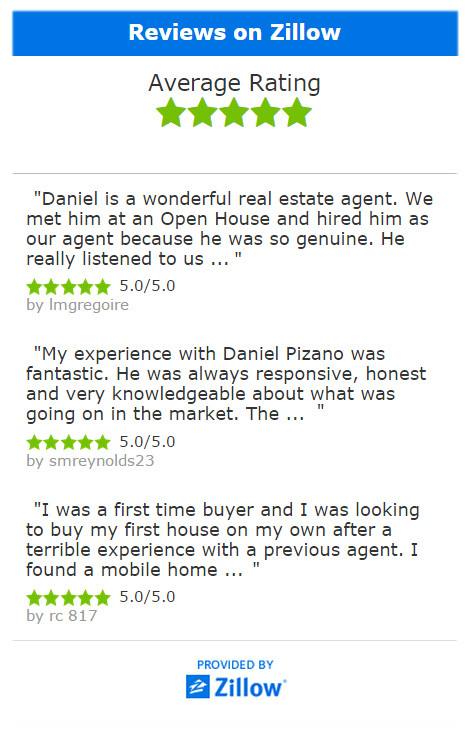 This last view of the market combines monthly inventory of properties for sale along with new listings and sales. The graph shows the basic annual seasonality of the market as well as the relationship between these items. 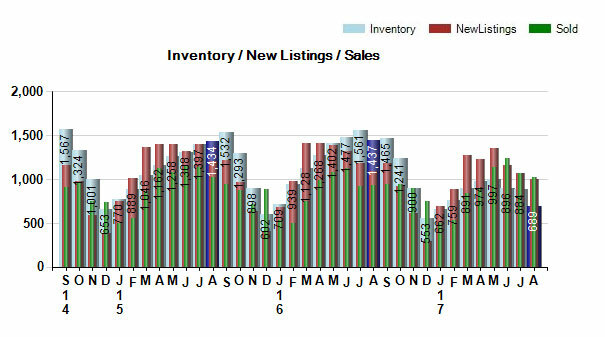 The number of new listings in August 2017 was 1000, down -6.7% from 1,072 last month and down -8.5% from 1,093 in August of last year.